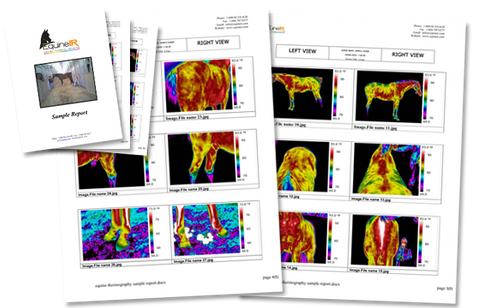 Our Client Reports contain detailed graphic interpretations of our scans and veterinary evaluations conducted by InterpretIR, a network of farriers and veterinarians specializing in Thermography and affiliated with Integrated Equine Infrared. Learn about Dr. Joanna Robson, Technical Director to EquineIR and Integrated Equine Infrared, and auther of Recognizing the Horse in Pain...and What You Can Do About It at Inspiritus Equine, Inc.
All things we come in contact with in daily life emit infrared energy that we cannot see, in the same way the sun emits UV rays not visible to us. With Thermal Imaging, an infrared detecting camera is used to read radiant heat emitted by an object or animal and to create a graphic map of the radiant heat coming from the skin's surface. This Thermal Image gives a visual depiction of underlying circulatory levels of the body, providing an objective view of the subjective feeling of pain, giving you the ability to see what your horse feels. Diagnostic imaging modalities may be divided into anatomic and physiologic. Anatomic imaging such as x-ray, pinpoints anatomic structures affected, but only gives a static image of the disease process and does not have the ability to see soft tissue conditions. Thermal imaging is a physiologic imaging modality which detects changes in blood flow and metabolism, and has the ability not only to see tissue conditions but can also recognize areas that are indicative of anatomical issues. Costs are reasonable and include Veterinary interpretation. In the image above, Thermal Imaging detected nerve damage in the Right Front Leg in a horse that showed no lameness or diagnositc changes in this affected leg, but which had been demonstrating compensatory lameness in the Left Front Leg. Used extensively in the equine world since the 1996 Olympic Games, infrared thermal imaging inspections are a safe, cost effective, quick and non-contact method of examining a horse to identify and locate the source of problems or injuries. Infrared thermal imaging is a complementary tool to be used in conjuction with your veterinarian's services. It is beneficial for use in these 3 areas: Preventative Screening, Diagnostic Identification & Treatment Monitoring. In the image above, Thermal Imaging detected a cannon bone fracture in a young horse showing no lamenes and scheduled to race the following week. Following routine thermal imaging, the horse was x-rayed and a fracture was confirmed. The horse was layed up; she subsequently went on to win The Breeder's Cup. Using the latest FLIR Infrared Imaging equipment, Becky Tenges travels to you to conduct Thermal Imaging scans. Our travel to your location eliminates any need for the horse to travel, leaving them relaxed and stress-free in their own surroundings. Thermal Imaging is a non-invasive procedure, much like taking a video of your horse, that we carry out in 20 - 30 minutes. Equine patient preparation is key to assuring high quality Thermal Images. So, we work closely with you to ensure that you know the protocol to follow prior to our arrival at your farm to scan your horse. Studies show that the majority of saddles don't fit. Thermal imaging can show you. Report contains an overview letter, image-by-image analysis, identification of problems and asymmetries, and detailed recommendations to your local veterinarian for follow-on diagnostic steps and a treatment plan, if appropriate. Report arrives in 36-72 hrs. 24-hr service is available. Vet-to-Vet consultation is available if desired. In the image above, Thermal Imaging was used during a live action assessment on a horse with non-specific hind end lameness. A stifle lesion was identified while the horse was being lunged.